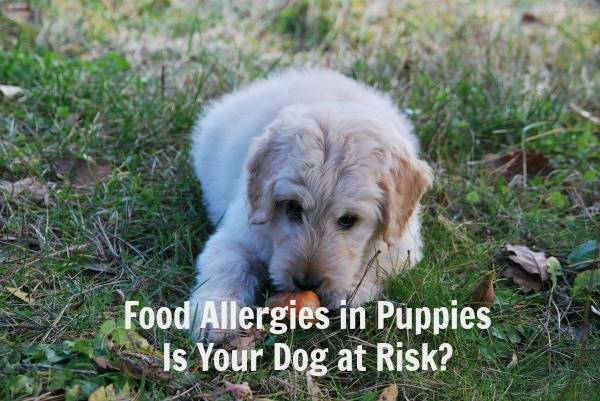 Food Allergies in Puppies and Dogs: Does Your Puppy Have an Allergy? Food Allergies in Puppies: Is your dog showing signs and symptoms? Discovering if your dog has food allergies is both a stressful and worrisome experience. How do you know what your dog is allergic to? What should you do to treat their symptoms? Does your dog even have food allergies, or is it something else altogether? The moment your new puppy comes home for the first time is always amazing and memorable. Finding out they have sensitivities, allergies, or just general discomfort is a hard pill to swallow, though. Rest assured, there are specific signs to watch out for that will help you indicate whether or not your dog is suffering from food allergies. Likewise, you will be able to monitor and handle the situation, helping them live a symptom free and healthy life. Dogs are susceptible to food allergies and sensitivities just like you are. That being said, your puppy certainly won’t be able to tell you when it’s not feeling well. Take it upon yourself to always monitor your puppy; look for symptoms of discomfort, itching, or general pain, and prepare yourself for what comes next if you notice them. If you’ve seen any rashes or bumps on your puppy, keep an eye out for any symptoms. Food allergies in puppies usually show their ugly head in these typical signs. If your puppy is exhibiting any of these signs, or even anything similar, it’s time to consult your veterinarian. While they likely won’t be able to tell you exactly what your puppy is suffering from, they can help you narrow the prospects down. If food allergies or sensitivities are the likely culprits, you’ll need to put your puppy on an elimination diet. Doing this will allow you to narrow down which food your puppy is sensitive or allergic to and find out which ones are in the clear. 1. Choose a protein and carbohydrate source your puppy has never been exposed to. If you’re the first parent, your puppy has ever had, this should be easy. Common protein sources in dog food are chicken, chicken products, or beef. Uncommon ones - the ones you should consider for the elimination diet - are meats like kangaroo, duck, buffalo, or salmon, and carbohydrates like oatmeal or sweet potatoes. If your puppy is showing signs of an allergic reaction, it’s time to switch the food out. Replace their meals with the new protein and carbohydrate source. If you’re choosing processed food, ask your vet which brand they recommend for your puppy; some dog food companies make allergy friendly foods exactly for this purpose, and your vet can tell you which brand and formula will provide all the essential nutrients for a growing puppy. If your puppy’s symptoms start to improve, you’ve likely found the allergen. If they don’t, wait 2-3 weeks before testing another new food source, and try again. Once your puppy’s symptoms clear up, you can start reintroducing other ingredients one at a time, allowing you to carefully monitor which foods are making your puppy react, and which aren’t. On the other hand, you can also continue feeding your puppy the new, allergy-free food without reintroducing old foods into the mix at all. Throughout the elimination diet process, keep in close contact with your vet. Confirm whether any reactions are to be expected or not. If no progress is made throughout the diet experiment, your puppy might be allergic to something other than food, in which case your vet may need to prescribe medication. If your dog is still showing signs of allergies, it could be those training treats. Beyond figuring out which food is right for your puppy, you also need to identify which treats and bones are safe during this stage of their lives. With puppy teething and training both requiring dog chews and treats, you need to be especially careful which ones you utilize, as most are made with highly processed ingredients your puppy might be allergic to. This stage of your pup’s life is vital for training good behavior, which often comes with the use of treats. Look for dog companies who sell all-natural products, and make sure they’re never imported from countries like China, where food quality standards are weak or nonexistent. Treats made from organ meats or unprocessed beef are a great option for allergy-free training sessions. Of course, with puppies and small dogs, it’s essential you opt for adequately sized treats, like these liver bites. Likewise, some “human foods” are also acceptable treats for puppy training time. Snacks like raw carrots or other vegetables, apple slices, or even fully-cooked shrimp can make excellent rewards as your puppy learns good behavioral practices. When you are dealing with food allergies in puppies, stay safe with these nutritious snacks and treats. Diagnosing and treating food sensitivities and food allergies in puppies can be a time consuming process; you won’t always be able to identify the food-culprit right away. For the sake of your pup’s health and well-being, though, commit to finding the right outcome and enabling a happy and healthy life - for the both of you. Author Bio: Kristen Youngs, the author of Food Allergies in Puppies, is a dog enthusiast who spends much of her time writing about experiences raising Annabelle, her own four legged friend.